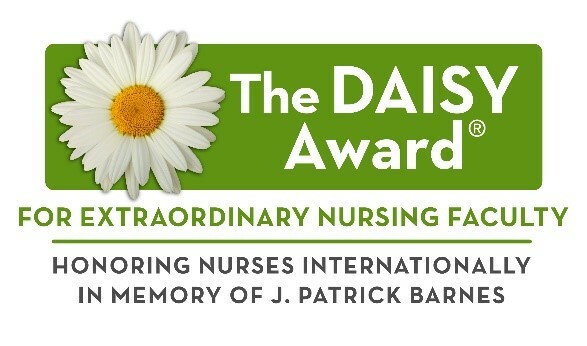 The DAISY Foundation, as part of its service to the nursing profession’s role in patient care, established The DAISY Award for Extraordinary Nursing Faculty and Nursing Students. The purpose of this program is to provide to colleges/schools of nursing a national recognition program they may use to demonstrate appreciation to nursing faculty members and nursing students for their commitment and inspirational influence in nursing. The Foundation hopes that, in some way, this program will contribute to a positive work environment for faculty in schools and the educational journey of nursing students. Nursing Faculty members who are nominated for The DAISY Faculty Award exemplify the kind of faculty member that students, colleagues, staff and administrators recognize as an exemplary educator and an outstanding role model. These are are individuals who have made an impact on their students, the students’ future patients, and the nursing profession. These faculty members consistently demonstrate excellence in the classroom, in their clinical expertise and by providing outstanding leadership to our students and in the healthcare community. Nursing Students who are nomimated for The DAISY Student Award show above and beyond care and compassion for patients and families as they are learning. They are dedicated, motivated and adaptable. The student demonstrates not only the best clinical care but also impacts patients and famlies with human spirit and kindness which are two tremendous assets to the art of nursing and healing. Students, faculty, LHSON alumni, clinical site affiliates, and staff members may nominate a deserving nursing faculty member or nursing student by filling out a nomination form. The nomination period is open from through April 19, 2019.